March isn’t just a time for championship basketball, it is also a time for championship swimming. 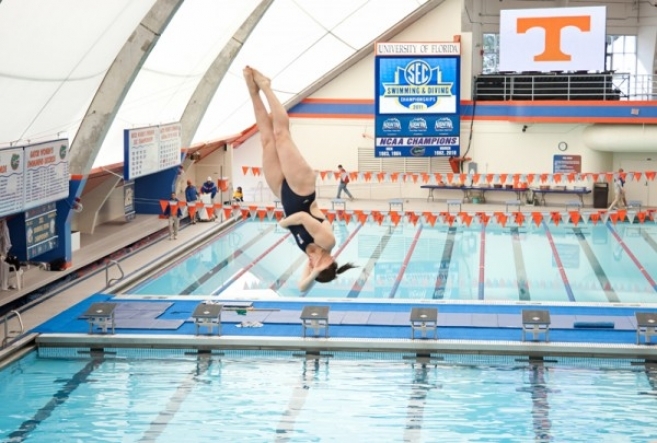 At this year’s NCAA Woman’s Swimming and Diving Champions, 322 of the best student-athletes in the two sports will meet at the Texas Swimming Center on the campus of The University of Texas at Austin. But for the first time, PEM Surface Creations’ aquatic matting will be there to greet them. When swimmers and divers get out of the pool they can expect to feel the comfort of PEM matting on their feet, as well as the benefits from its slip-resistant properties. PEM’s textured surface reduces the risk of slippage in wet conditions and allows moisture to flow through the matting, eliminating standing surface water. To get here, the swimmers had to meet minimum requirements on strokes like the free style, breast stroke, butterfly and back stroke. And divers had to compete in Zone Meets to qualify. In years past this event has featured Olympians or future Olympians, making us even more excited to have our product chosen for this event. The championships will run from March 17 to the 19. ESPN3.com will stream finals sessions live on Friday and Saturday, March 18 and 19 and ESPN2 will air a 90-minute show at 1:30 p.m. ET on Tuesday, April 5.